Knowing better than to have any idea what expect from the Punk Fox label, I let this four piece from Leeds, UK, Nervous Twitch walk me through the past fifty years of music history across the two sides of this single. It's weird that I find myself going back to those girl groups from the '50s thanks to Guantanamo Baywatch or yesterday's single from Susan practically daily but you'd be crazy not to hear the direct thread between The Shangri-La's and something like Personal and the Pizzas. These guys start out in the early '50s and head straight into post punk that round peg in the square hole. A-Side's "Jonny's got a gun" blasts right into that chorus lyric right along with a three chord jangle at spastic speed, whoever came up with their name gets a free drink. Erin on vocals and has got it out for this Jonny character, who's been historically maligned in so many songs. Bash that sentiment out on the fretboard, 'got a gun' repeated that over and over in the garage, cranking on chords, tracking harmonies together updating The Angels "Boyfriends Back" and uping the stakes. Enter huge reverb on "And we did" with muted clicking chords to slow things down. A toy xylophone sounding electric plunged under water and held down with weights. I like this slower, down low vocal sounding like the Midnight Snaxxx leather jacket harmony with the attitude of The Coathangers. Greaser '50s vibe with a tambourine and warbling wah of a reverb coiled up and sprung down the stairs like a slinky. The drums have that shallow cardboard box feel, a nice mix of homemade and studio sounding, nailing that crafty quality of these sort of reenactments. They should open for Shannon and the Clams or Hunx of course, there's room for more of this winking nostalgia. B-Side's "Modern World" opens with a heavy Wire sounding bass line that shifts into post punk reggae Clash sound. Erin is right in the front of this mix, slightly blown out with a jagged vocal delivery over stabs of new wave strings between this stutter jangle. More ominous and bleak sounding until they hit that chorus and it's almost a hyper maximum density shoegaze. They seem to have absorbed the past fifty years and playing through all of it across these two sides, can't decide? You don't have to, play it all. 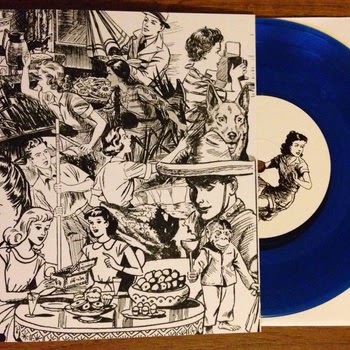 Get this by contacting Chris dot punkfox at gmail or their bandcamp page.